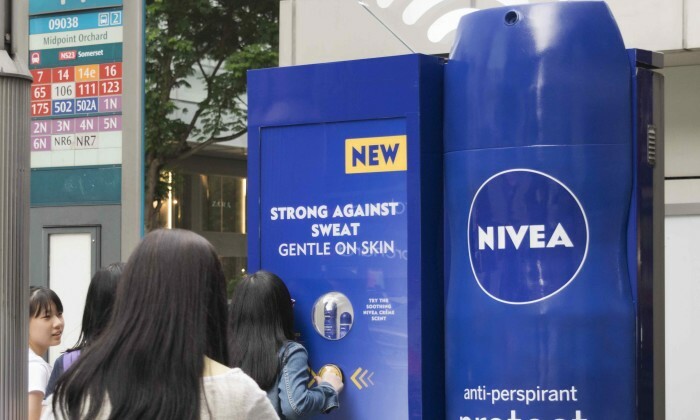 Beiersdorf Singapore launched an 6-sheet outdoor panel at Midpoint Orchard with Mediacorp OOH Media for female commuters to experience “The Scent of Care”. As part of its introductory promotions for Nivea’s Protect & Care Anti-perspirant, it wanted to bring the brand’s value of care to life. The bus shelter panel features a life-sized 3D Nivea deodorant bottle alongside an exposed cutout featuring a sample bottle, inviting members of the public to experience being cared for by the soothing Nivea crème scent. Upon pressing a button on the panel, the public will be able to smell a sample of the deodorant sprayed from the cutout. Around the panel, promotors will also be handing out sample sniff cards featuring the iconic scent and a discount code for commuters and passers-by to purchase at Guardian’s online store or at Watsons stores islandwide. The panel was placed in the heart of Orchard’s shopping district, opposite 313 Somerset (a youth and female-centric retail hub) attracted many female youths, PMEBs and tourists working or shopping around the area to sample the deodorant. Clicks Communication will work closely with clients and creative agencies in sharing best practices and insights of the platform. ..
Online pay television KLfive has launched new internet television service with an option for users to pay for only what they want ..